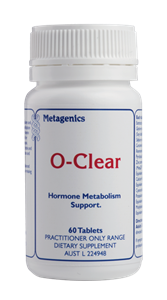 Provides all fat soluble vitamins, which may be compromised in those with a low fat intake, in one convenient capsule. Fat soluble vitamins have associated applications. For example, vitamins A, D and K are all essential in bone health. 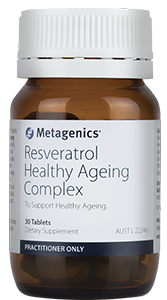 Taking some fat soluble vitamins together can optimise their efficacy, for example, when vitamin A and D are taken together, the expression of the RAR, VDR and RXR receptors and osteocalcin gene transcription are optimised 3 This is likely because RXR is the main partner receptor for the vitamin A RAR and the vitamin D VDR receptors. Fat soluble vitamin intake can be compromised. For example, up to 73% of Australians have insufficient vitamin D levels 4 Vitamin D from food sources is less biologically active and in insignificant amounts in most foods. Vitamins A, D and K are essential for bone health. Vitamin A regulates the proliferation, differentiation and gene expression of chondrocytes, osteoblasts and osteoclasts which express the RXR receptor, shared by vitamin D. Both of these vitamins stimulate gene transcription of osteocalcin which binds calcium to new bone. Vitamin K helps in the transport of calcium. 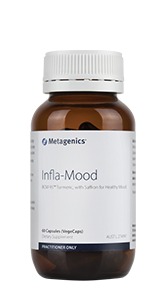 A range of nutrient forms for improved efficacy. 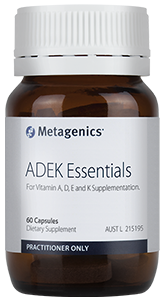 ADEK Essentials contains 2500 IU of vitamin A and the equivalent amount of betacarotene. 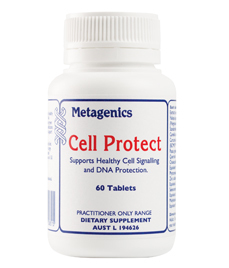 Adults: Take 1-2 capsule daily with food, or as directed by your healthcare professional. Warning: When taken in excess of 3000 micrograms retinol equivalents, vitamin A can cause birth defects. If you are pregnant, or considering becoming pregnant, do not take vitamin A supplements without consulting your doctor or pharmacist. *The tocotrienols complex in ADEK Essentials is from sustainably sourced palm oil. Free from corn, dairy protein, lactose, eggs, gluten, wheat, nuts, yeast, soy protein, starches and salt. Free from artificial colours, flavours and preservatives.